Although P. F. Chang’s has been around since the early ’90’s, I was kind of late to the game in trying it out. I specifically remember the first time that I had it a few summers ago while working in Austin. I don’t remember what I ordered, but one of my co-workers (who apparently has better eating self-control than I do) ordered their lettuce wraps and offered to share some with me. I distinctly remember thinking “Where have these been all my life?” So. Good. My world had changed. I’m pretty sure that I scarfed down my whole dinner and half of hers because that’s how I roll. I’m not typically a fan of chain restaurants, and P.F. Chang’s is no exception, but I sure do dig their lettuce wraps. I would not call these a copycat recipe necessarily, but they are darn good. We made a double batch and polished them off as a midnight snack the same evening. Enough said. They can get me through any P.F. Chang’s craving, which is fortunate because we live nowhere close to a P.F. Chang’s. Adapted from Our Best Bites and Branny Boils Over. In a non-stick pan, cook ground turkey until lightly browned. Add water chesnuts, mushrooms, lemon zest, juice, soy sauce, sesame oil, garlic, and ginger. Lightly cook, stirring frequently, for 5 minutes. Remove from heat and fold in cilantro and scallions. 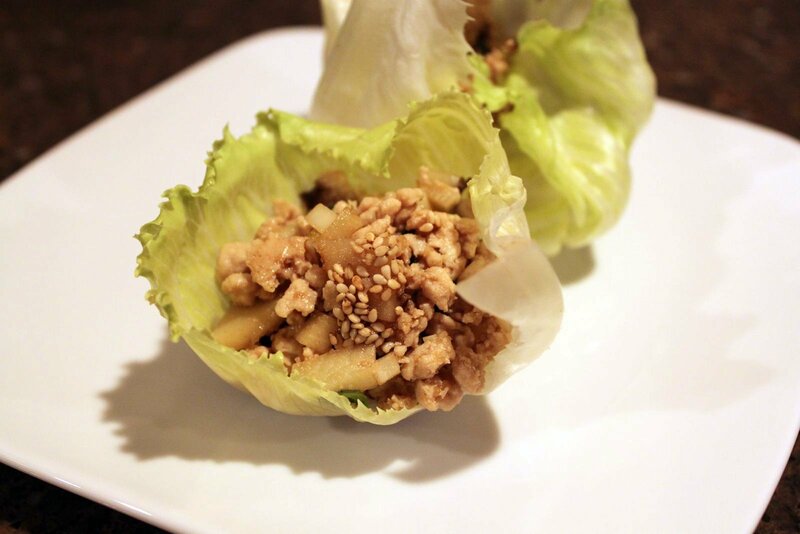 Divide mixture among 6 iceberg lettuce leaves and top with sesame seeds. Serve warm with Asian Dipping Sauce. Another tasty creation from Brit! Wonder if I could get my H to eat a wrap where the “wrap” is lettuce as opposed to a tortilla?? I dunno. Chris likes lettuce wraps in theory, but he considers them to be more of an appetizer than a meal. I ended up sharing these with one of my girlfriends and then Chris came through the kitchen later to devour what was left. I considered making these in actual wraps with shredded lettuce for a more substantial dinner for Chris, but we didn’t have wraps the day I made these. I totally share your feelings on chain restaurants and PF Chang’s. For the most part I hate ’em, but there is always a dish or two that I kind of love. PF Chang’s Singapore Street Noodles are damn good, even though I hate myself for going there. I’ve never tried their lettuce wraps, but yours look awesome! Sheesh Brit. Between our love of running and dogs, farm owning and similar food eating, it is too bad we don’t live closer. I’m sure we’d be great friends (and have a blast cooking dinner for one another). Glad you are continuing to find recipes on my blog you like. Yeah, I think we would have a good time! Maybe our paths will cross sometime.